These stocks offer investors an attractive mix of growth and value. Investors looking for exposure to the soda industry have a wide range of stocks to choose from, everything from a global brand powerhouse like Coca-Cola (NYSE:KO) to a tiny at-home beverage machine producer called SodaStream (NASDAQ:SODA). Fragmented industry growth meant that most soda stocks underperformed the market in 2016. That could set the stage for above-average gains from here -- or it could portend another disappointing year ahead for investors. With that in mind, let's look at a few soda specialists worth keeping on your watch list. Sales growth is for the last complete fiscal year. Data sources: Company financial filings and Yahoo Finance. National Beverage, the company behind the hit soda water brand La Croix, leads the industry in growth right now. It last posted a 9% annual volume spike, compared to Coca-Cola's 2% uptick. In fact, the La Croix brand is soaking up market share, with demand rising at five times the industry's pace. The sparkling water industry is projected to pass $5 billion of sales by 2020, and so there's a potentially long runway for future growth if the company can keep its water-focused portfolio relevant with consumers. 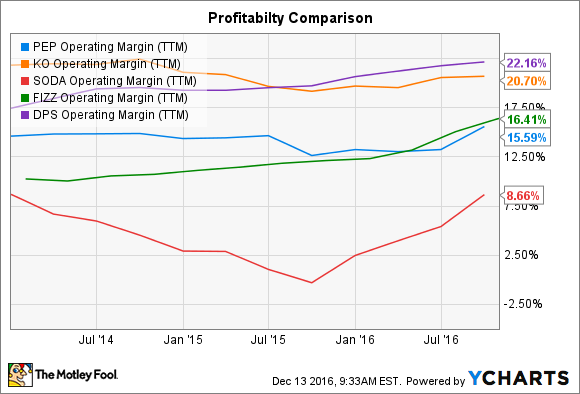 National Beverage's profit margin trails its larger rivals, which is no surprise given their huge scale advantage. However, CEO Nicholas Caporella and his executive team are making strides at closing the gap. Operating margin recently crossed 16% of sales, putting it just ahead of Pepsi. Investors looking for higher risk (with a potentially higher return) should consider SodaStream. The at-home carbonated beverage maker nearly blew up its business over the past two years as it pivoted away from a soda focus toward sparkling water. Yet the company appears to have survived the near-death experience. Sales are growing at a healthy clip again, its cost structure is far lighter than it was in 2014, and SodaStream could keep its incredible stock growth momentum with a strong holiday season this year. For stability, though, Coca-Cola has just about everything that a conservative investor could want. The market share leader owns or licenses over 500 beverage brands that together account for nearly 2 billion drink servings consumed around the world every day. Sure, its overall results have been disappointing lately as consumer tastes veered away from core brands like Diet Coke and people rejected core ingredients like sugar. But if Coke has proven anything over its 97-year history, it's that the company can (eventually) adjust to changing tastes. The management team is hard at work reshaping its portfolio, and while investors wait for the pivots to pay off they can collect a hefty 3.3% dividend yield. In my view, Dr. Pepper Snapple offers the best balance of growth and value right now. Its portfolio of brands is big enough to put it in (a distant) third place behind Coca-Cola and Pepsi -- but not so big that targeted bets can't quickly move the sales needle. Meanwhile, its 14% profit margin isn't far from Coke's despite its much smaller sales footprint. Investors can thank strong execution on cost cuts for closing that gap this year. Image source: Dr. Pepper Snapple. Dr. Pepper is on pace to boost earnings by double digits even as net sales tick up by 2% this year. Its stock hardly budged in 2016 while the company improved its market position and lowered costs. Thus, as the cheapest stock of the bunch in terms of earnings, even slight market share growth in the years ahead could produce impressive returns for investors going forward.